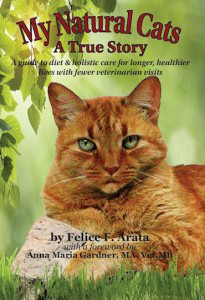 Become educated for the sake of your cat – Feed your cat raw. All cats’ digestive needs are designed to eat raw prey to maintain the highest possible quality of life; horses, cows, birds and other animals are designed to eat various kinds of diets suited for their own digestive systems. We wouldn’t feed a cow a plate of raw meat now would we? Unfortunately, many humans do not understand the digestive needs of a lot of animals especially the cats because pet food companies have brain washed the public and made feeding our cats more of a convenience with bags or cans of pet food just to make our human lives easier- However, in reality this kind of convenience truly challenges the cats whole existence; we and the cat suffer from this commercial convenience by the burdened of expensive vet bills when the cat suffers those often and various illnesses stemming from those convenient commercial foods.